Thousands of educators in Los Angeles are preparing to go on strike Monday, Jan. 14 in what will be one of the most important and biggest labor actions of the decade. LAUSD is the 2nd largest school district in the country, yet they’re severely underfunded and understaffed. Going on strike is never an easy decision. In fact, as well all know, it’s a last resort. Workers put everything on the line to stand together for what’s right. That’s what educators are prepared to do Monday. For their students. Parents. The community. For our entire labor movement. That’s why it’s so important that we all stand in solidarity with over 30,000 educators to demand smaller class sizes, more nurses and counselors, a fair wage, and accountability for charter schools. Cost of living has increased 27% since 2008. California’s student-to-teacher ratio ranks 48 out of 50. Students in transitional kindergarten to sixth grade take more than 100 standardized LAUSD tests. California is the richest state in the nation, yet ranks 43 out of 50 in per-pupil spending. California’s student-to-counselor ratio is 945:1. LA’s charter school industry has grown by 287% since 2008, draining nearly $600 million from public schools each year. We have an opportunity to go beyond solidarity and engage in joint struggle, breaking down the barriers between “worker” and “community.” When we stand together, we win! And to all the brave workers who are striking for our communities, our families and our children, Thank you! 1. Adopt-a-School: If you live in the LA area, adopt one or several schools where parents and community members can join the picket lines before and after school. ● Follow this link to find the school closest to you. ● Please help us track support for our teachers by filling out this form. ● Check www.WeArePublicSchools.org for picket and rally locations and times. On Friday, in advance of the strike, join education unions in wearing red to support educators. Take a selfie and post to social media. Use the hashtags #strikeready #redfored #UTLAstrong and tag @UTLAnow We have sample social media posts and graphics to show #solidarity with educators below. Also visit www.WeArePublicSchools.org for announcements and resources. Please amplify the strike by posting on social media that you won’t cross the line! Stand up for Public Education! 3. Sign a petition to support striking educators! 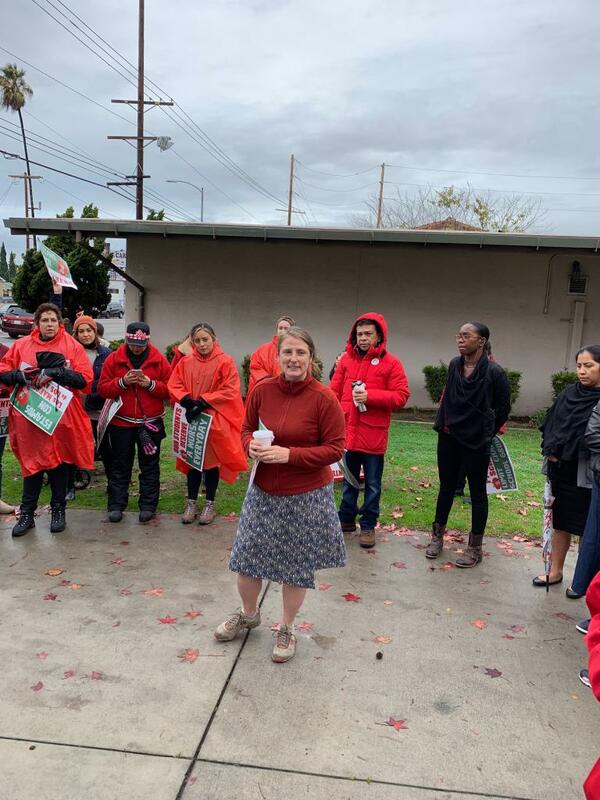 Our sisters and brothers at CTA have set up a petition for us to share messages of support with striking educators at UTLA and the Oakland Education Association, which is also preparing to strike. Please share far and wide so we get as many supportive messages as possible! 4. Leadership School for Education and Action: Recruit members of your organization to be a part of the Leadership School for Education and Action that will bring together parents, students, union members and others in an intense and exciting week-long program of political education and action. Check out this attached flyer for more information.